Coburn Enterprises Search Engine Optimizatin and marketing clients recieve a weekly report helping them to understand how their website is doing and how our work is helping them improve their search rankings. This page is where they can learn more about using their reports. If you are not currently a Coburn Enterprises Search Engine Optimization client you may want to consider joining us! Learn more about our Search Engine Optimization and Marketing support programs. The visibility score is the sum of all visibility points for each keyword based on their rankings and is calculated for a website for the selected search engines and all keywords. Positions 31 and below: 0 points. The visibility score is the sum of the points given to a website by each search engine. The visibility percentage is given by the sum of visibility scores from all the search engines divided by the maximum number of points that the search engines can provide. The visibility score is 52 points. The visibility percentage is 52/90 = 0.5777 = 57.77% which approximates to 58%. Rankings overview gives you a brief summary of your current rankings in the selected search engines (Coburn Enterprises focuses on Google, Bing & Yahoo. Additional Search Engines can be tracked for additional fees), and briefly shows your rankings dynamics. The number of first place rankings for a website for the selected search engines and all keywords. 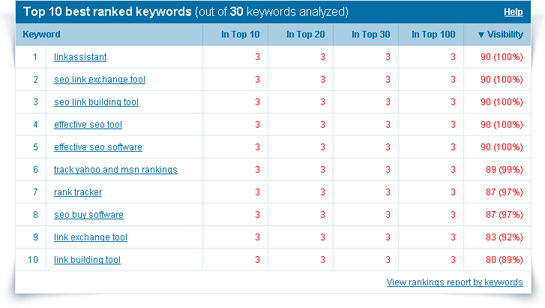 The number of top 10 rankings for a website for the selected search engines and all keywords. The number of top 20 rankings for a website for the selected search engines and all keywords. The number of keywords that were found within the search depth (100 by default). The number of keywords that were not found within the search depth (100 by default). The number of keywords that have moved up in SERPs compared to the previous update. The number keywords that have moved down in SERPs compared to the previous update. The number keywords which rankings have not changed since the previous update. The number of new keywords that have been found in the selected search depth (100 by default) since the last update. The number of keywords that have been found in the selected search depth (100 by default) in the last update but have no longer been found in the current update. Search engines overview gives you a brief summary of your current rankings for each search engine. 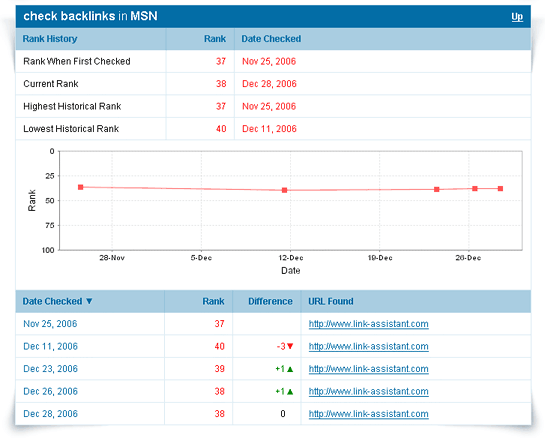 Besides, it allows you to view rankings report by search engines. The number of top 10/20/30/Max rankings for a website for each search engine and all keywords. Visibility of the website for each search engine and all keywords. Here we will show how your selected keyword phrases rank in all selected search engines (arranged by their Visibility). It also allows you to view rankings report by keywords. Visibility of the website for each keyword and all search engines. Shows the most efficient keywords with KEI (Keyword Efficiency Index), number of searches, competition and visibility calculated by keyword for all specified search engines. You can view rankings report by keyword efficiency as well. If your keyword choices are not getting you the results you want, you may consider hiring us to research your industry in more depth and pick the best keywords to optimize a site for by choosing phrases with the biggest number of searches and the lowest competition. Search engines overview gives you a brief summary of your current rankings for each search engine. The column lists all keywords you have specified. Shows your ranking (up to Max) by keyword in the specified search engine. Shows difference between your current ranking and the ranking at the previous check date. Gives the URL found in the specified search engine by each keyword. Shows a keyword cloudmap for all specified keywords and details tables for each keyword. The prominence of a keyword in the cloudmap depends on the Keyword Efficiency Index (KEI) value of the keyword. Current ranking for the keyword in each of the specified search engines. Gives the URL found by the keyword in each search engine. 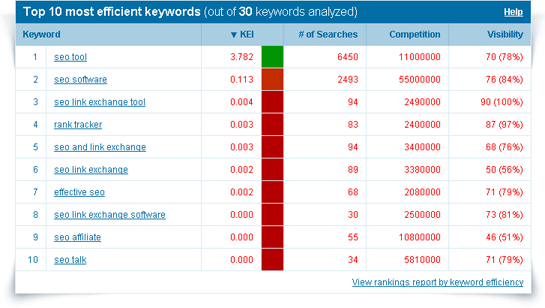 Shows specified keywords arranged by KEI (Keyword Efficiency Index), number of searches, competition and visibility calculated for each keyword for all specified search engines. You should attach particular significance to the keywords having KEI with a green mark. These keywords must be the most efficient ones. We suggest that you should use such keywords to promote your site. They will help you make it easier and faster, thus bringing you more profit. Shows a keyword cloudmap for all specified keywords, prominence depending on the KEI (Keyword Efficiency Index) value. There are historical data tables for each keyword in each search engine. The top of the table represents a brief rank history summary for the keyword and the search engine. Shows the rank of the word in the search engine when first checked with Rank Tracker and the date of first check. Shows the rank of the word in the search engine when last checked and the latest check date. Shows the highest rank of the word in the search engine ever found out at a check and the date it was recorded. The mid part of the table is a progress graph to illustrate how your site’s rank changed since you first cheched it with Rank Tracker. Each bold dot stands for your ranking at a check date. The bottom part of the table lists all checks arranged by the date, with the rank, difference recorded at the date and URL found by the keyword in the search engine at the date. This report can show you how many times a keyword has been actually searched by real people over the last month, plus how stiff the competition for this keyword is in Google. This “number-of-searches-to-competition” ratio is known as Keyword Efficiency Index, or KEI.